This Friday’s employment report took on some additional importance last week as the Fed reminded markets that they remained focused on incoming data for guiding their decision regarding a rate hike in December. Last week’s policy statement was interpreted as more hawkish, since it referred to monitoring data for determining a rate hike “at its next meeting.” Some interpreted the mention of the specific calendar date as an indication of greater hawkishness, after several weeks of increasing speculation that a rate hike would be pushed further out into 2016. 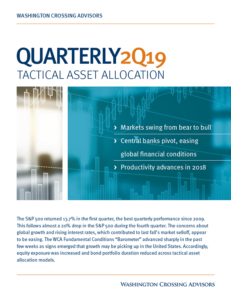 The Fed’s posture seems to lean in the opposite direction of the European Central Bank (ECB), who recently indicated a willingness to pursue even more accommodative quantitative easing (QE) policies. The October employment report takes on some greater significance than normal in this context. To the extent that a date is highlighted on the calendar and the decision to raise or not is a function of “incoming data,” the October employment report is one of the few remaining key inputs. According to Bloomberg, analysts expect an increase of 182,000 net new jobs and a fall in the unemployment rate to 5% from 5.1%. As for wages, the data is expected to support the idea that hourly earnings are growing at roughly 2% on an annualized basis and hours worked are increasing roughly 1% on an annualized basis. Taken together, this implies roughly a 3% growth rate in wages and salaries. 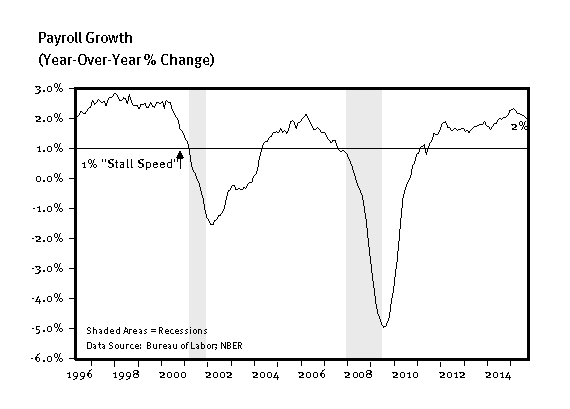 The overall growth in employment should be near 2% (chart below), well above the 1% “stall speed” that we’ve seen as a tipping point for prior recessions. Beyond the payroll report, we are also supposed to get a host of purchasing manager survey data. The October manufacturing Purchasing Managers’ Index (PMI) is likely to come in soft. The index has been trending down from near 55 at the start of the year toward 50 currently (50 is the approximate dividing line between expansion and contraction for the index). Some overhang of inventory, soft demand from overseas, and a strong dollar are all weighing on manufacturing this year. At the same time, we should get some additional data showing that unit labor costs are up just over 2% this year while productivity growth is near 0%. This has negative implications for profit growth. We continue to look for a pickup in activity. There is some speculation that further easing from Europe or China may provide a catalyst in the months ahead. For now, we are maintaining a realistic view on returns. Several years of outsized gains in equity markets have helped to catapult U.S. household’s net worth to over $85 trillion from $55 trillion at the bottom in 2009 and $68 trillion before the start of the financial crisis. Looking forward, we see positive returns over the long haul, but lower than what we’ve experienced in recent years. LONG-RUN STRATEGIC POSTURE: Strategic allocations are set to reflect our long-run forecasts for key asset classes. We expect policy rates to remain low as central banks continue to push lower-for-longer rate strategies. Eventually, rates should rise back to more normal levels, but this is expected to happen gradually and unevenly. 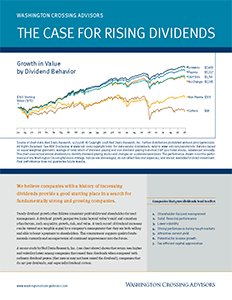 Fixed income returns are expected to lag current yields as rates rise. Equity returns will track moderate growth in global GDP with little to no further lift from margin expansion (margins are already elevated). Equity valuations appear reasonable and in line with historic multiples, so no additional return is being attributed to margin expansion.